Our show brings together four artists who embrace the aesthetics of Japanese culture. Seiko Atsuta and Akemi Nakano Cohn were both born in Japan and are now living in the United States, while Glen Kaufman and Carol Westfall were born in the United States and lived and studied in Japan. In the work of all four artists, Eastern and Western sensibilities merge into a wonderful juxtaposition of imagery and technique. Glen Kaufman borrows materials, imagery and processes from Japanese culture. The grid format reminiscent in Japanese shoji screens forms the visual structure for surihaku, the Japanese metal leaf application he applies to silk. His images glimpsed through these formal constructs recall scenes of two worlds-Asia and America. Akemi Nakano Cohn struggles with these two worlds as she states, "There is a tension between the eastern values with which I was raised and western values to which I am adjusting at present." This tension is clearly present in the imagery she explores but what is interesting is her adherence to traditional Japanese dyeing methods, especially the Nassen paste resist techniques. Carol Westfall also blends two cultures in her imagery. 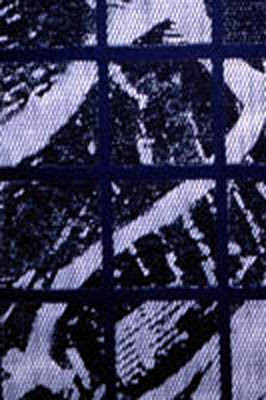 But in contrast to traditional Japanese techniques, her work uses hi-tech processes such as digital printing or computerized jacquard weaving. Seiko Atsuta adopts more of a conceptual cross-cultural approach. Her current work contemporizes the Shinto tradition of Omikuji as she explores the commonality of human wishes. In her installation, Wish Necklace for 28 women, she encloses the wishes of 28 women in giant paper pearls strung together with her own hair. Another installation, Wish Flower, floats in mid air; according to Atsuta, "This idea originates from the Japanese children's tradition called Teru Teru Bozu which are tissue dolls made especially as a way to wish for sunny weather during rainstorms." While each of the four artists below reflect a different way of synthesizing two cultures, they all strongly reaffirm the Japanese aesthetic of beauty and form. Click in the images for an enlarged view. 22" x 17" x 2.5"